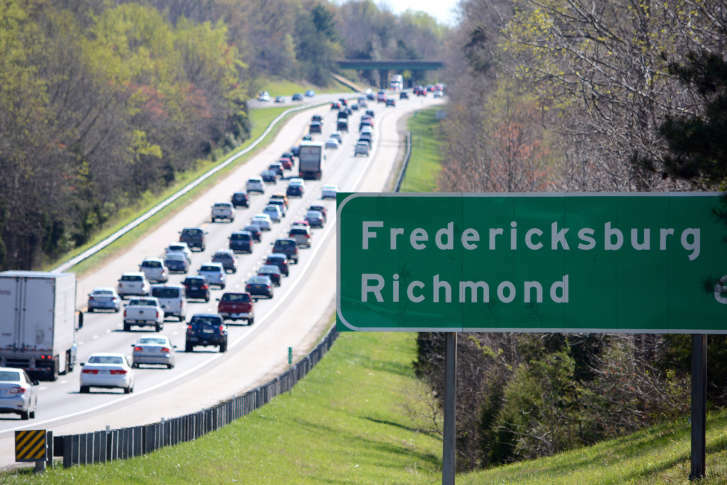 A project to alleviate some of the congestion between Washington and Richmond missed out on getting state funding, and now the Fredericksburg area may put in its own money to get it done. WASHINGTON — There are heavy delays on I-95 between Washington and Fredericksburg almost every day, no matter whether it’s a work day, a weekend or even a holiday. But a project to alleviate some of that congestion missed out on getting state funding, and now the Fredericksburg area may put in its own money to get it done. “I don’t want to put all the blame on the state and the feds, though this is supposed to be their bailiwick — i.e., transportation — and they’re doing a not-so-stellar job in dealing with it,” Fredericksburg city councilman Matt Kelly told WTOP Friday. The Fredericksburg area was hoping the state would approve a plan that would separate local and through traffic between U.S. 17 and Route 3. But because of a funding formula called Smart Scale, only the southbound side of the project was approved. “Obviously, finishing the northbound project is a big issue — separating through traffic from local traffic — which is causing your backup,” stated Kelly. The solution is already planned and the impact seemed to be easily apparent. Now, the Fredericksburg area is considering establishing its own transportation authority. The move would require approval from the General Assembly. The idea is inspired partly by frustration with the state and federal officials for not fixing what is considered to be their road. Kelly said the Fredericksburg area is expected to double in population, reaching more than 600,000 residents, by 2040. For him, the congestion won’t fix itself. How this authority would be funded hasn’t been determined yet, and many aren’t sure it is the solution. Kelly said the region had also considered trying to draw more big employers to the Fredericksburg area, reducing the number of people who commute from places such as Stafford and Spotsylvania counties up to Northern Virginia or D.C. However, the councilman believes adding a big employer — one that could bring another 3,000 residents to the area — will still have a significant impact of the area’s busier arteries, such as Route 3 and U.S. 1 and 17. And even then, the region could still miss out on transportation money from the state government. “What makes that situation even worse is, through the matrix that the state uses for Smart Scale, you only look at the ‘benefits’ to the region for those improvements on 95, when in fact what you are doing, if we were to end that blockage between 17 and 3, we’re helping 95 from Maine to Florida,” stated Kelly. Along with making Virginia a chokepoint for long-distance travelers, particularly between Washington and Richmond, the councilman argued the congestion dissuades visitors from places such as Northern Virginia from making a trip to the region. The extra time sitting in I-95 means the local treasuries take a hit, too. It’s a problem Kelly said the region and the state have been waiting too long to fix. Right now, they are looking into whether the cost of creating the transportation authority — and the cost to taxpayers — is worth it. Kelly said the region is about a year or two away from such a district, but could be set up in time for the next round of Smart Scale decisions.